When travelling the highways and byways of North America, you’ll run into countless thousands of places to fuel up. Whether you call them service stations, filling stations, petrol stations, or gas stations, it’s safe to say that there is no shortage of options. 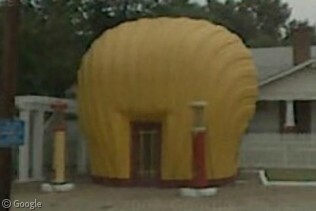 In the early days of mass automotive travel, fuel stations often resorted to some wacky gimmicks to differentiate themselves from the pack and lure in customers, such as novelty architecture that made the station building even more of a roadside attraction than the fuel they were selling. Today, many of these wacky 1930s-era stations are icons to thousands of visitors every year. 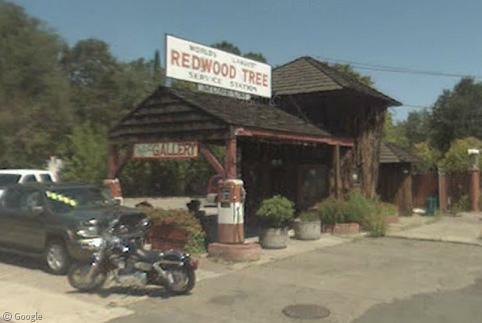 The Redwood Tree Service Station and Car Care Center in Ukiah, California was built in 1936. Three 1,500-year-old giant redwood trunks were carefully selected, quartered, and reassembled in its present location. Note the original sign, still in place, proclaiming it the ‘World’s Largest Redwood Tree Service Station’ (not exactly the largest service station category, but remarkable nonetheless). Not only are the original pumps still in place, but the station still services vehicles for oil changes, tires, and detailing after all these decades. The main ‘trunk’ houses a small museum and gallery dedicated to the Redwood Tree’s unique history. 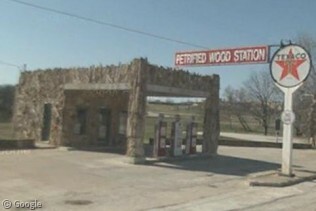 The Petrified Wood Station in Decatur, Texas is a Texaco station built in 1927. Eight years later, the owner rebuilt the exterior entirely out of petrified wood. The station is part of Texas Plaza, which contains not just the station but a petrified wood cafe and petrified wood motel. A similar station still stands in Lamar, Colorado, now used as a used car dealership office. 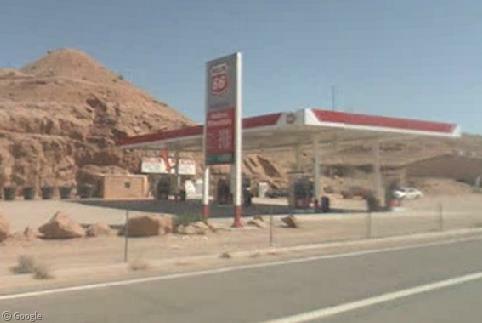 Hollow Mountain Gas & Grocery in Hanksville, Utah is literally built into a cave in the hillside. The unique structure came about by accident; initially the plan was to blast away part of the hill to make room for the station. During construction, it was determined that it might just be easier to drill a large hole in the hill and house the station and store inside. Call us crazy, but we believe that this building may have been a Shell station at some point. 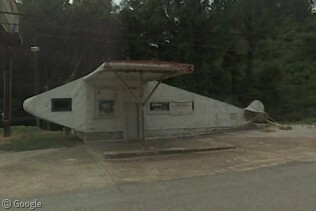 Yes, this shell-shaped Shell was one of eight such stations built throughout Winston-Salem, North Carolina in the 1930s. The last one standing, it now serves as the regional office and information centre of the state historical society, Preservation North Carolina. Note the gravity-fed fuel pumps still in place. 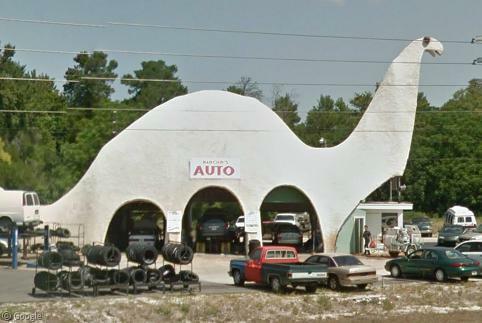 In the same vein, Harold’s Auto in Spring Hill, Florida is located inside a giant dinosaur that was originally a Sinclair Oil station built in 1964. Sinclair’s mascot is a large green dinosaur nicknamed Dino. Route 66 is perhaps the most famous of the early American highways, so it’s no surprise that it was home to one of the country’s most iconic rest stops. 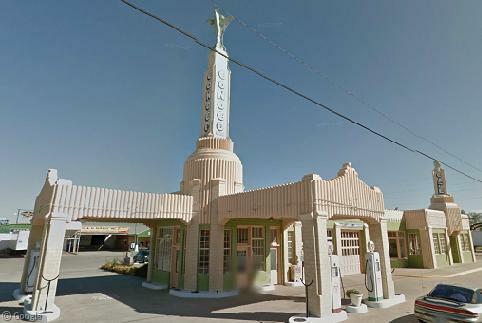 The U-Drop Inn, also known as Tower Station, is a gas station and restaurant built in 1936 in Shamrock, Texas. The art deco design was inspired by the image of a nail stuck in dirt: one nail for the station; one for the restaurant. Covered in ceramic tile, the U-Drop Inn stayed in business for six decades before being taken over by the city of Shamrock. Today, fully restored to its original grandeur, the U-Drop hosts a museum, visitor centre, and the local chamber of commerce. Keen eyes will recognise the building as the inspiration for Ramone’s Body Shop in the Disney blockbuster Cars. 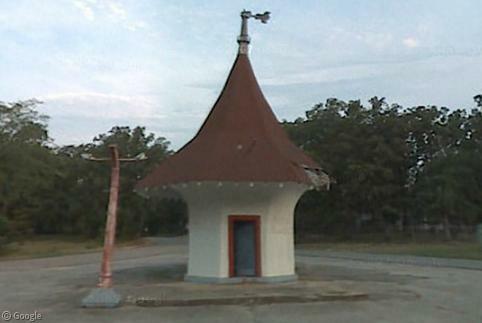 Sadly, many of these quirky old buildings have yet to be rescued, like the Roundtop Filling Station at the entrance to Sherwood, Arkansas. The Roundtop was built in 1936 for Pierce Oil and was one of the major fuelling points for travellers between Little Rock and St. Louis. In operation as a service station until 1972, the building has sat derelict since 1999. Despite being placed on the National Register of Historic Places in 2008, the building is now in disrepair. For many, years, it seemed that Knoxville, Tennessee’s Airplane Service Station, also known as the Powell Airplane, would suffer the same fate. The Powell brothers built the station in 1930 in the shape of an airplane due to Elmer Powell’s love of airplanes. Sometime in the 1960s, the airplane became a liquor store, and after that a produce stand, a bait & tackle shop, and a used car lot before being abandoned. This 2007 Street View image captures the airplane at the height of its disrepair, but today the airplane is slowly being restored. Even today, there will be an occasional station that goes out of its way to be quirky. 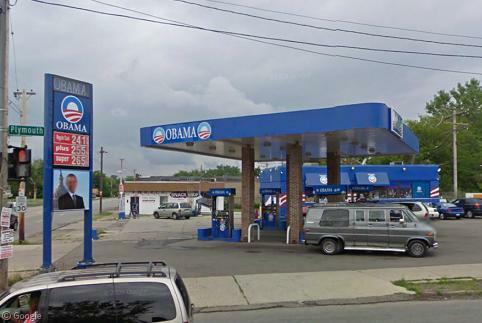 Take, for example, a Detroit-based businessman who was so enamoured by Barack Obama’s 2008 presidential run that he changed the brand name of his three stations to Obama Fuel. Even after Obama won, the name of the business remained in place and has now stayed on for a second term, just the like the prez himself. 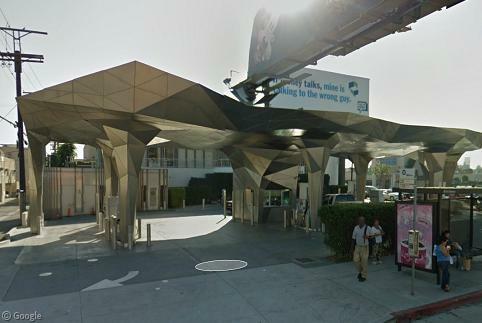 One of the most unique stations built in recent years is this futuristic-looking ARCO station on the Los Angeles/Beverly Hills boundary. Originally a run-of-the-mill gas station, it was rebuilt as a showcase station using recycled eco-friendly materials, water-collecting canopies, and solar arrays. Even the pumps are constructed from recycled materials. Heading north of the border, Canada’s most famous gas station isn’t even a real station! 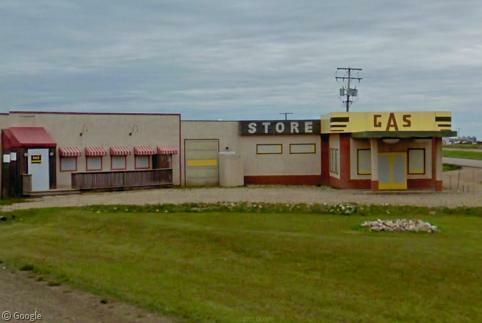 Comedy fans probably known Rouleau, Saskatchewan better as the fictional town of Dog River, where Corner Gas, the most successful sitcom in Canadian television history, was filmed for six series between 2003 and 2009. The eponymous station and its neighbouring restaurant, the Ruby, were housed in this film set at the entrance to Rouleau. While the set has largely been dismantled in order to protect it from souvenir hunters, it remains a popular pilgrimage site for fans of the show. Even the grain elevator across the highway retains the name ‘Dog River’. So, the next time you’re looking for some pop culture out on the road, stop by the ol’ filling station. 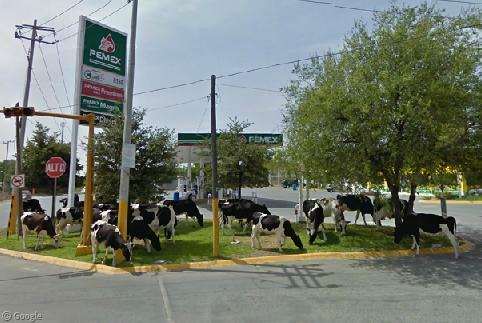 Even the cattle are doing it! the interesting thing with that Shell Station in North Carolina (and rather sad one as well) is that it’s located in a very run-down part of the city–hair salons have barbed wire and fencing covering their windows. What’s amazing is that given the location, the pumps (which are probably very valuable) don’t get stolen, the site is very well kept, and even though it’s in a rough neighborhood, it still stands out. Too bad it’s the last one. Here’s a gas station with a Beech 18 over the pumps…well, where the pumps used to be. Just about 5 miles from my house. Thanks for including the Roundtop Gas Station on this list! I live nearby and have taken a few pictures out at the old station. The city does own the property, and I believe it’s in the process of getting a grant to fully restore it. There was some work done on it within the past few years, thanks to the gas station being used as part of the movie “The Last Ride” about Hank Williams. The station got a fresh coat of paint on it. I haven’t seen the movie, so I don’t know if it’s any good. Cloquet, Minnesota boasts the only gas station designed by Frank Lloyd Wright. It’s easy to find; type “Cloquet, MN” in Google Maps and it puts you right in front of it.